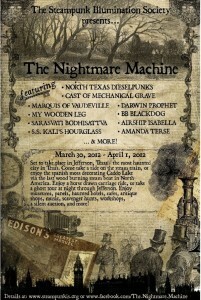 The weekend of March 30-April 1, 2012 are the dates set for the Steampunk conference called Nightmare Machine 2012 which is going to be a fun, interesting Jefferson Texas event. After reading through all the information on the website I am so curious to see what this event will bring to our town. Some of the information from the site, I found to be of help to explain this unique group; “Well to begin with let’s clear up the name. “Steampunk” started as a joke. There was a movement in science fiction to write in a genre known as “Cyberpunk”. When various writers began exploring similar concepts and ideas but setting them in a pseudo Victorian world the term steampunk was jokingly coined. The name stuck but even steampunks are constantly debating “well what is steampunk?” Like all communities however steampunk has grown and developed a life of its own. It is now a rich and vibrant social scene attracting people from all walks of life. 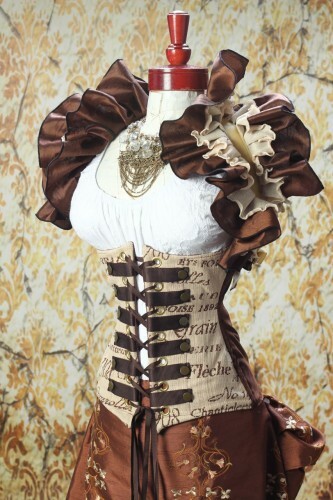 While I was checking out some of the clothing they wear I was pleasantly surprised to see they like to wear Victorian clothing or variations on that theme. Well since we all know that Jefferson is no stranger to that type of attire, I believe this group may just fit in with the natural flow of historic vibe here. Now I’ve heard that you need an appropriate name to go along with the fun here are two; SteampunkNameCreator or Steampunk-name-generator, give them a try it’s fun to see what they come up with. There is so much information about this group have a look at Nightmare Machine 2012 and don’t miss all the links and information on the SIS main site. During this Jefferson Texas event weekend the White Oak Manor bed and breakfast is offering a 20% discount for all of our rooms. Call today to insure your reservation 903-665-8185. I found this video of the Marquis of Vaudeville that will be playing during the weekend. Tammy ~ Just this past November a sweet friend of mine had a steampunk-themed wedding. We weren’t able to attend, sadly, because it was out of state but her wedding attire was beautiful. She wore a red & white striped corset, a long white skirt and a white top hat. She looked stunning! Should be a fun event for your town. I am getting excited to see what it’s all about. It brings to mind vaudeville, Victorian, sci-fi and a little rebel all together. Can not wait to experience this event. Steampunk Illumination Society, we cant’ wait to experience all the fun this event will be bringing to Jefferson. 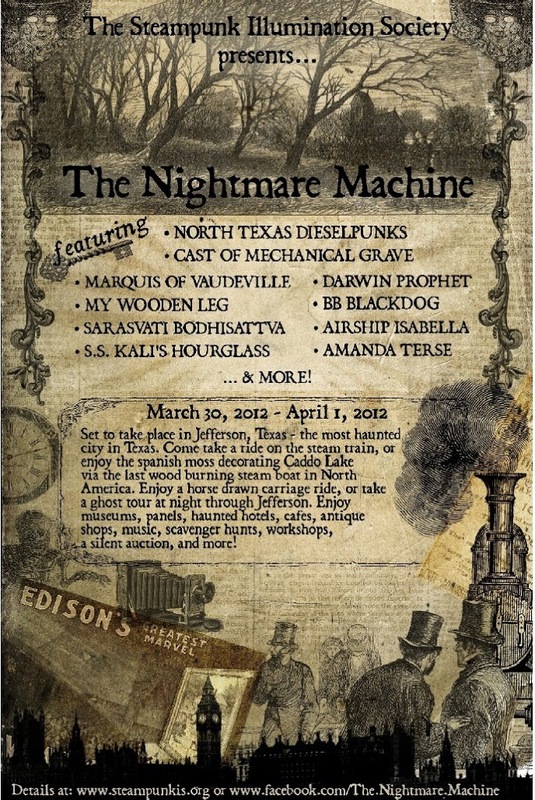 Steampunk comes to East Texas. This is a good day. I am really looking forward to this.